The US Leading Optics Manufacturer visit Israel. 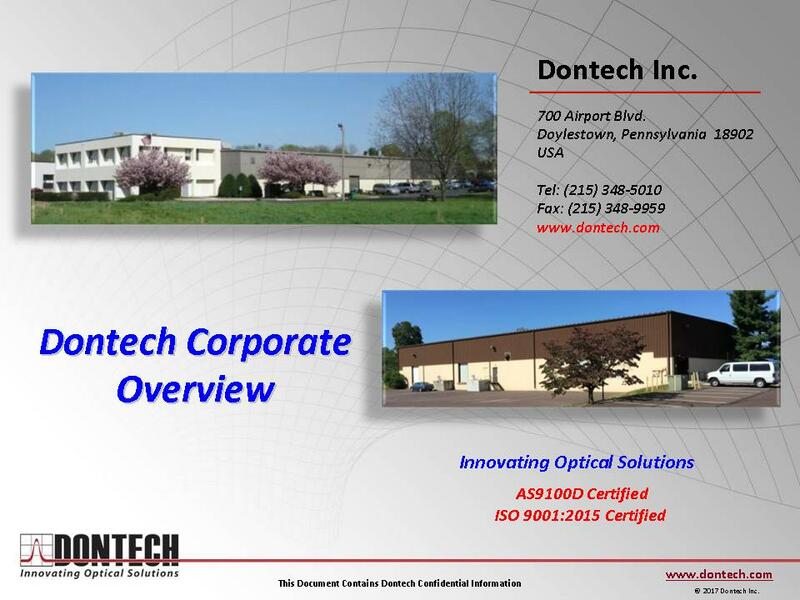 Dontech, Inc.
Dontech, Inc. designs and manufactures optical filters, coatings, and optical components for electronic display enhancement and optical assemblies. The company’s products include antiglare and antireflective coatings, conductive films, heat reflective and vacuum deposited coatings, Electromagnetic Interference shielding, polarizers, contrast enhancement, dichroic, static dissipating, and band pass filters. Its products also include VARGard antireflective films, antiglare and antireflective optical filters, conductive coatings on various substrates, night vision compatibility filters, transparent heaters, fine wire meshes, and custom optical enhancements; and ancillary products, such as gaskets, screen printing, mounting frames and bezels, nameplates and graphic overlays, and LCD assemblies. The company’s optical filters and components have applications in LCDs, optical components and assemblies, organic light emitting diodes, CRTs, LEDs, electroluminescent displays, plasma displays, vacuum fluorescent displays, electronic equipment cabinets and enclosures, structural and shielded windows, and instrument panels. Its primary markets include military, avionics, medical, industrial, and electronic instrumentation. The company was founded in 1971 and is based in Doylestown, Pennsylvania. Copyright © 2019. All Rights Reserved To Militram Futuristic Technologies.